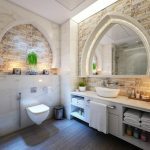 Whether you want to add a hint of luxury to your bathroom or transform it into your own oasis of tranquility, design trends for this year will help you give it a unique character and an aura of authenticity. From the glitz and glamour of lush details to effortless beauty of organic design, these bathroom trends will inspire you and transform your bathroom into a lovely home spa. Tile designs for 2017-2018 feature a plethora of enticing patterns, shapes and styles. Especially in 2018, tiles are used to introduce an unexpected pop of color to simple bathroom designs, while a retro black-and-white combination is a classic choice. If you’re a fan of patterns, you’ll be happy to hear that you’ll have a variety of intricately-designed options, ranging from Moroccan motifs, to Mediterranean-inspired designs and modern geometric shapes. Mixing and matching different tile styles has been enjoying great popularity this year, so you can give rein to your imagination. Luxurious details are used to create a dramatic effect in 2018 bathrooms. Luxurious chandeliers, elegant freestanding bathtubs, high-end showers with French doors are all décor statements that work as stunning focal points in stylish bathrooms. Home-owners introduce these lush details in the attempt to recreate the glamorous ambiance of chic boutique hotels in their home-spas. Whether it’s an intricately designed mirror, vintage chair or a beautiful tub, these pieces are worth the investment because they will undoubtedly elevate your bathroom décor. Pictures with aquatic motifs are a thing of the past. Bathroom walls are now decorated with modern artwork with abstract designs. If you have an empty wall, you can create your own bathroom gallery, using lovely paintings. 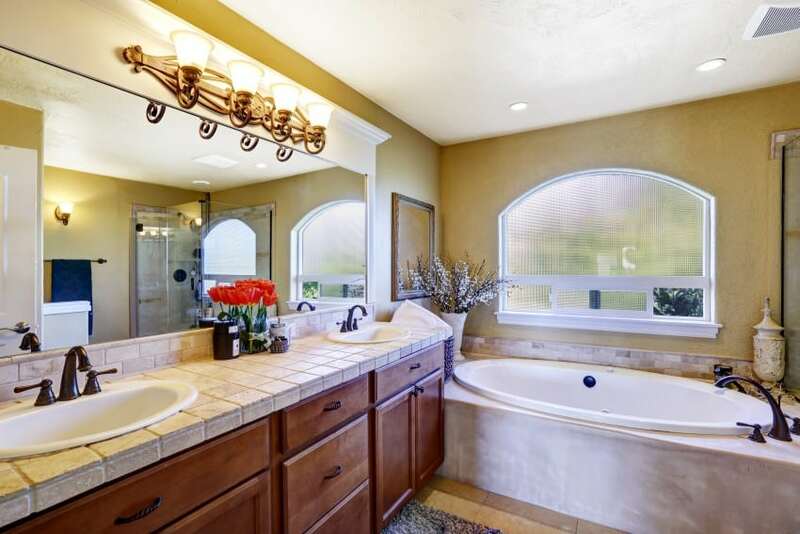 You can also experiment with their arrangement to create the wow effect in your bathroom. If you want to create a cohesive look, you can use motifs and colours in the paintings for the rest of your bathroom décor. A subtle yet stunning lighting scheme is a crucial element in 2018 bathrooms. Several layers of light are essential for creating a functional yet elegant design. While glossy chandeliers and chic pendants work as lovely accent details, subtle recessed LEDs are more appropriate for creating a soothing atmosphere. Candles are also an inevitable element in bathrooms with a spa-like atmosphere. A new lighting scheme in your bathroom will introduce a sense of novelty and accentuate its beautiful features. You can experiment with vintage lamps, brass pendants or luxurious chandeliers to elevate the style of your bathroom. 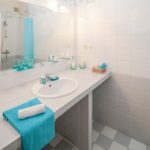 All-white bathrooms might exude elegance and sophistication, but it seems that other colors dominate the year of 2018. Modern bathroom designs have embraced splashes of conspicuous and stylish hues, such as Greenery, Pantone’s colour of the year. 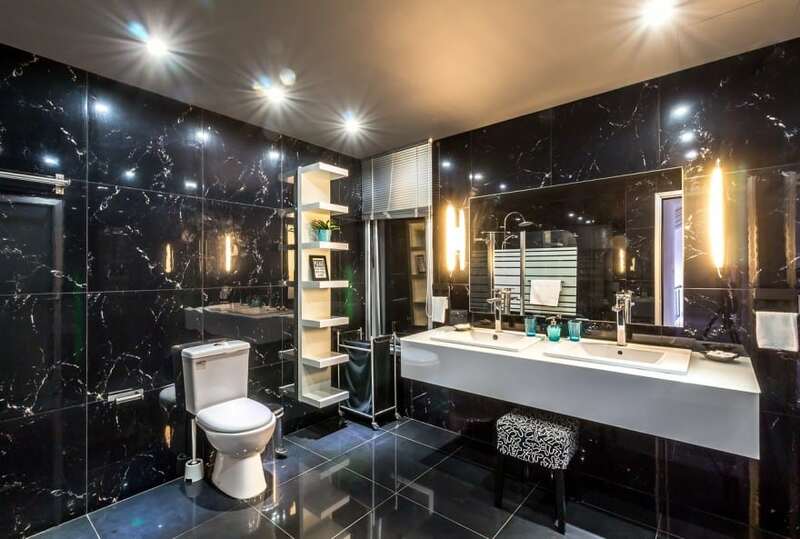 Dark color palettes have found a way back to the 2018 design scene and are widely used to give character to modern bathrooms. Different shades of grey are used to create an atmosphere of tranquility and elegance. Black is another popular choice, especially when paired up with black cabinets. Bold colors combined with natural materials are key to designing a stylish bathroom in 2018. A chic bathroom vanity is a must, no matter the style or the country. While marble vanities are used to add a touch of decadence in French bathrooms, those in India feature soft and curved edges. Vanities made of natural stone are the most popular choice in Italy, while the UK home-owners have embraced rustic-looking ones with wooden finishes. 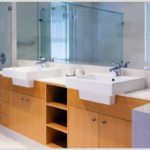 Similarly, bathroom vanities in Sydney feature elegant designs with an organic touch of natural materials. 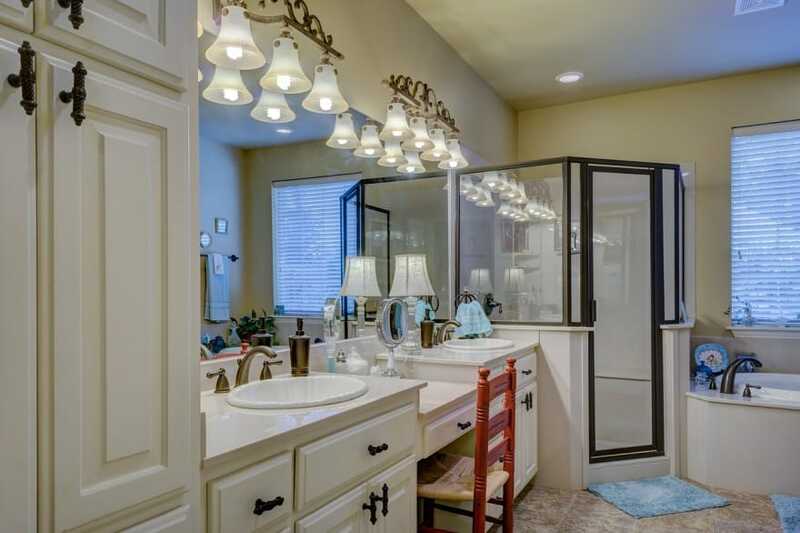 Thus, depending on your personal taste, you have plenty of design options for your vanity. Whether you want one with a vintage charm or a contemporary flair, a bathroom vanity will definitely complete your bathroom design. Stunning wallpaper designs are yet another stylish trend for 2018. 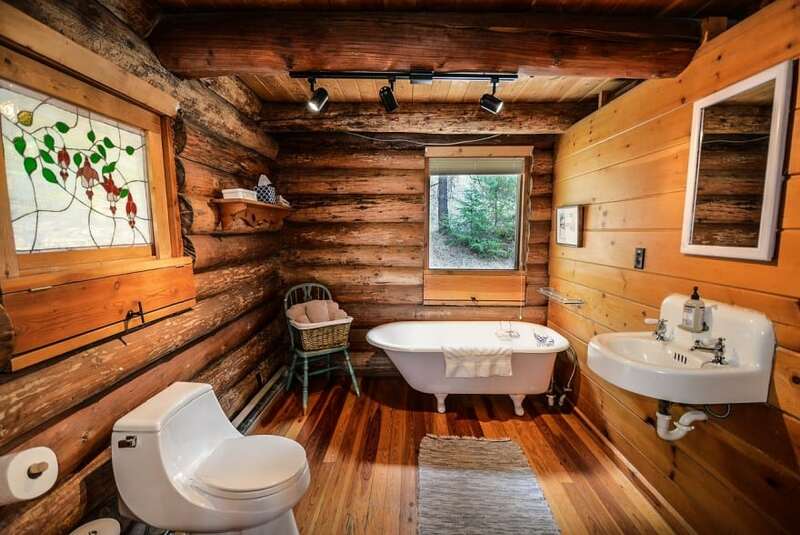 While there were once meant for powder, living and dining rooms, now they have taken over entire bathrooms. If you want an understated look, you can use lovely wallpapers just for the wall behind the vanity as an accent feature. However, if you’re ready to go big, you can use them for your entire bathroom and even the ceiling. You can use colorful wallpaper to break a monochromatic look, nature-inspired motifs to bring in natural energy and other intricate designs that fit the style of your bathroom. Bathrooms of 2018 feature simple, organised and minimalist looks that exude elegance, which can mean only one thing – no clutter. And the best way to keep clutter at bay? Storage. From vintage armoires to wall-hung storage and statement cabinets, you can get creative with your space. You can also introduce lovely wicker baskets, elegant floating shelves and apothecary jars, but stick to simple and understated designs. 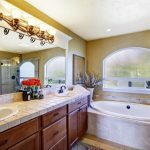 Organic designs for bathrooms is one of the most popular trends in 2018. A combination of modern features and natural materials is used to create a warm and inviting ambiance perfect for home-spas. Warm wooden furniture creates a lovely contrast against modern bathroom design that gains an effortless beauty. 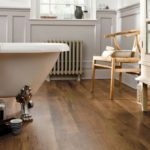 There’s plenty of stylish ideas for creating a natural look in your bathroom. Think in terms dark hardwood floors and lovely wooden furniture, rugged stone floors and walls and natural décor. Plants are an essential element in bathrooms this year that will add a touch of nature to your bathroom. You can also use bare branches and add vases of fresh flowers, but keep the decoration simple. Modern designs with an organic, natural flair feature simple, minimalist looks that exude elegance, serenity and tranquillity. You can even try out specific interior styles, such as Scandinavian or rustic-modern designs. Area rugs in bathrooms are inevitable accessories used to create an ambiance of warmth and comfort. They are used to introduce a pop of colour or intricate patterns and add character to a bathroom. For a lush look, you can go with a Persian area rug, while those made of natural materials are more suitable for nature-inspired designs. 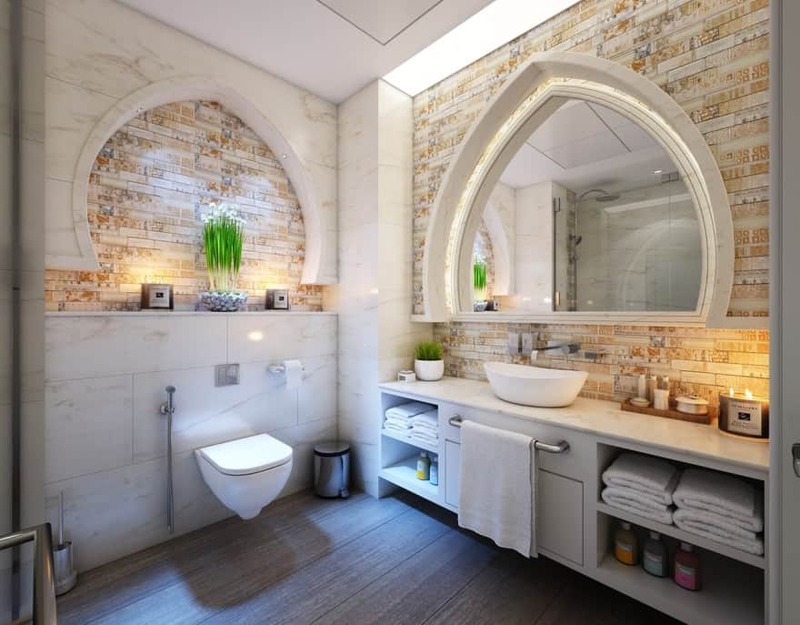 These bathroom design trends for 2019 are bound to elevate your bathroom décor and bring in a sense of novelty. You can use them to create a spa-like atmosphere where you can simply unwind or a luxurious ambiance where you can pamper yourself.